August 14, 2017 August 14, 2017 Amanda B.
I’m so excited to share this new math bundle full of fun activities to reinforce different math concepts. 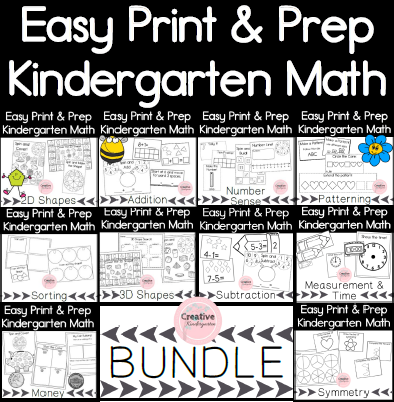 Easy Print and Prep Kindergarten Centers is full of hands-on, entertaining math centers! It is endlessly growing: more products will continue to be added to it. I am currently working on: 3D Shapes, Measurement and Time, Symmetry, Money and Subtraction. Once those have been added, I will keep making more products to add to each of the categories. That means the price of the bundle will keep going up, so buy it now so you can get all future uploads without having to pay more! Right now Number Sense, Addition, 2D Shapes, Sorting and Patterning are already included. Each of these activities is easy to set up: they are black and white (you can print them on colored paper if you want to brighten them up! ), easy to cut out and need minimal materials. That means that you will have all new centers ready for your class in no time! So go get it now and continue to receive new activities throughout the school year to keep building on your students’ math skills! I *love* your pattern flowers. I’ve used pipe cleaners before for color sorting for little ones (you know, for preschoolers learning about colors, and where they can put the right colored beads on matching pipe-cleaners). It was a fabulous hands-on method for learning colors. But this idea with the patterning, is perfect for taking a great hands-on tool to the next level. My Kindergartner is just learning patterning. She is familiar with AB patterns and is ready for ABC patterns. I simply LOVE this idea. Where do you recommend purchasing the beads that will fit well for pipe cleaners? Glad you like the activity! I purchased these beads at the Dollar Tree. I’ve also seen beads that would work at the Dollarstore. Even the plastic beads would work for this activity too!